In her recently closed show with ICA Baltimore at Gallery CA, Angela Conant investigates a curious relationship with color. 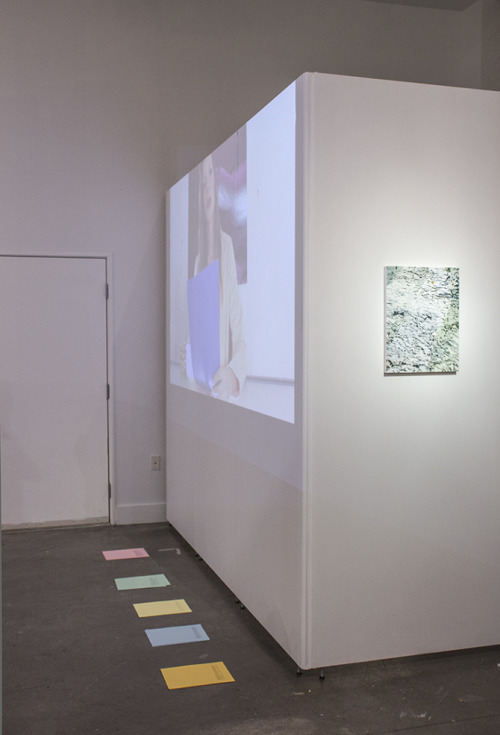 As the exhibition title “Deuteranope” clinically asserts, the presentation of paintings, sculptures, video, and installation peruses the condition of colorblindness through visual and performative manifestations. In this theoretical starting point alone, the writing of Clement Greenberg, the grandfather of formalism, immediately swarms my mind: is this a formalist exploration of color’s relationship to human vision? I resist this notion and, at times, Conant does too; in fact, it is in these sparse moments of rebellion that the exhibition stands out with a vibrant and inspired potential. “Deuteranope” is unabashedly ambitious in its thorough approach to the sensory reception of color. A large-scale video projection (Color Cast, 2015) offers an ongoing soundtrack of the exhibition’s thematic linchpin as four actors, including the artist herself, define the visual phenomenon of color and feebly attempt to explain various hues through spoken language. Seated as newscasters, the performers parody the feigned objectivity of the media when confronted with a complex and subjective headline such as color. While the work at times nears too literal an approach to the overarching subject at hand, its saving grace comes in the uncanny and dry delivery of dialogue, sporadically reminding viewers of the intricacies of visual perception as they explore neighboring works. A scattered series of paintings chiefly paired in diptychs (Human Gesture Paintings 1-5, 2015) is alive with formal interest but, when taken at face value, remains conceptually underwhelming. Each work treats a simple, gestural mark with careful dabs of pigment and consequently reads as sculptural and tactile rather than a hackneyed expressionist swath of oil paint. Conant conceives of the works in sets: one in bright pinks and purples over a field of flat green, the other in muted earth tones over a deep black ground. Through the latter, the artist intends to replicate the range of colors perceptible by those with red-green colorblindness. While I appreciate that Conant appears to ‘get to the point’ through these images, once again I remain unconvinced by the namesake premise of the exhibition. In other words, why are we supposed to be thinking about colorblindness now? This is not to say that the exhibition completely misses the mark. Where Conant stands out and ultimately excels is in her conception of a transmedia practice that situates painting and sculpture in a refreshingly dynamic relationship; emblematic traits of painting inform the creation of the sculptures, and vice versa. 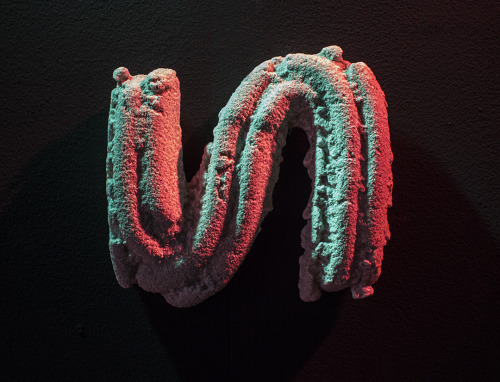 The image of each Human Gesture Painting, for instance, finds a three-dimensional, wall-mounted analog rendered in a coarse mass of plaster and sand (Human Gesture Series, 2015). Three sweeping forms appear tucked away beneath an imposingly low window while others fully occupy a dark gallery-within-the-gallery and receive intoxicating washes of red and green light. The simple starting point of the gestural brushstroke not only motivates the shape of each sculpture, but is itself disrupted as the paintings resolutely and attentively render the contours of a carefree flick of the wrist. The sheer muddling of the processes behind each artistic format revives what might otherwise be a conceptually wanting show and leaves me yearning for more of this rich transmedia experimentation. The current state of medium or—to re-insert Greenberg—medium specificity is a tricky one. Mixed-media approaches have assumed an established and respected place in the history of art, most notably with the Neo-Dada craze of the 1950s championing a persistent and ever-present crossover between traditionally separate media. On the other hand, following painting’s rise from its illusory ‘grave’ over the past two decades, a recent glorification of the specific capacities of the isolated medium has renewed and energized how we think about pigment on a flat surface. Conant’s transmedia approach feels markedly different and critically needed—the development of a mediumunspecific practice. As she translates not only forms but characteristic elements between the acts of painting and sculpture—simultaneously adhering to and augmenting the specific attributes of the two—Conant proposes a vision of medium that complicates its prevailing treatments. What might a variety of different artistic media look like in a detached yet nevertheless mutually reflexive relationship? While this question may not fully emerge through the thematic fog of Conant’s exhibition, its budding suggestion promises a captivating viewpoint from the artist to come.